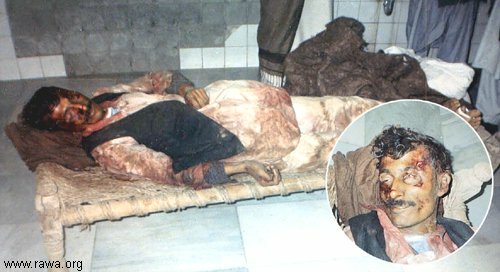 On November 23, 2004, Saleem son of Mohammad Zahar from Wardak Omerzai village of Laghman province was abducted by gunmen of Islamic Party of Gulbuddin Hekmatyar and after 2 days his dead body was found in Katal village that has been inhumanly tortured and killed by knife. Saleem was director in the Kabul bus station in Laghman province. People of the village know the killers but government announced that Saleem was killed by unknown gunmen and did not file any case. 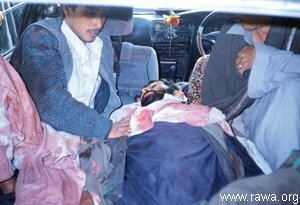 On December 13, 2004 Sheren Agha son of Gul Agha, a shepherd from Arab minority ethnic group in Qasim Abad village of Behsod District of Nengrahar province was killed by an armed person called Lashkar Khan who is from warlords army now part of the government "National Army". Warlords and their gunmen have forcibly distributed people's lands among themselves and do not allow anyone to grass their animals there. They are frequently building their luxury houses over the lands that belong to people of Arab minority group. In the past 2 years they have killed a number of shepherds who did not obey their order. Following the killing of Sheren Agha, Arab people staged a demonstration to protest the killings and occupying of their land by warlords. They took the death body of Sheren Agha to the offices of UNAMA, Independent commission of Human Rights and other government bodies and accused government of not taking notice of such issues.